What is optical properties of materials? Can you explain or define optical properties of materials in the field of material engineering? The 20th century, and particularly the latter part of it, can truly be called the Age of Optical Materials. This appellation is warranted in view of the ubiquitous role of optical materials and devices in some of the most important arenas of human activity, for example, fibers for optical communications; lasers and imaging displays for medical applications; optical coatings and devices (solar cells) for energy conservation; lenses, filters, and optically active materials for observing, detecting, displaying, and recording images in microscopy, photography, media, and information applications. We certainly have come a very long way when we consider that human involvement with optical materials and properties, prior to the past few centuries, was limited largely to aesthetic purposes, for example, mirrors, glazes for pottery, colored glass, pigments for paints, jewelry. But this does not even begin to accurately convey the dramatic progress that has been made. Optical materials can be broadly divided into two categories: passive and active. The active category includes those materials that exhibit special optical properties in response to electrical, magnetic, mechanical, optical, thermal, and other stimuli and interactions. Examples include electro-optical devices such as lasers, light-emitting diodes, and photodiodes, as well as magneto-optical recording media, luminescent materials, polymer photoresists, and Hquid crystal displays. Passive optical materials encompass everything else, including inactive, active materials. For example, silicon is active in a solar cell but passive when used in optical coatings. In this chapter examples of both passive and active optical properties are treated. All classes of engineering materials—metals, ceramics, semiconductors, and polymers—have representatives with interesting optical properties. In many of the modern optical applications, thin-film materials play a critical role and an introduction to this subject is therefore offered. The unifying concept that embraces all optical properties is the interaction of electromagnetic radiation with the electrons of the material. On this basis, optical properties are interpretable in terms of the electronic structure as influenced by atomic structure and bonding. Therefore, aspects of both quantum mechanics and electromagnetic wave theory are required to account for a fundamental understanding of optical phenomena. For the engineering applications we are concerned with, however, simple equations distilled from elementary physics are all that is necessary, and these will be offered without proof. In conducting solids like metals and semiconductors, a great number of electrons are available to interact with electromagnetic radiation. For example, metals contain a large density of empty, closely spaced electron states above the Fermi level. Incident photons over a broad wavelength range are readily absorbed by conduction band electrons. These excited electrons occupy higher energy levels where they may undergo collisions with lattice atoms. The extra energy is dissipated through lattice vibrations that heat the metal, and we speak of absorption. Alternately, if the probability of colliding with an ion is small, the electron will emit a photon as it drops back to a lower energy level. This is the origin of the strongly reflected beam exhibited by metals in the visible and infrared region. When the time it takes for electrons to become excited and deexcited is short compared with the period of the incident electromagnetic wave, high reflective can be anticipated. Physically, the electrons are able to respond quickly enough to establish an electrical shield against the (more slowly) oscillating electric field associated with the incident wave, preventing it from penetrating. These conditions are well obeyed for metals in the infrared. Of the nearly 80 metallic elements only gold and copper (and alloys of these metals) are significantly colored. All the other elements are white or gray, although in portions of the visible spectrum some metals have a slight tinge of color. Aluminum and chromium have a faint bluish, and nickel a weak yellowish, coloration. The overwhelming majority of metals reflect all portions of the visible spectrum and thus appear white. Gold and copper preferentially absorb in the green region, and these metals respectively assume the color of the reflected yellow and red light. 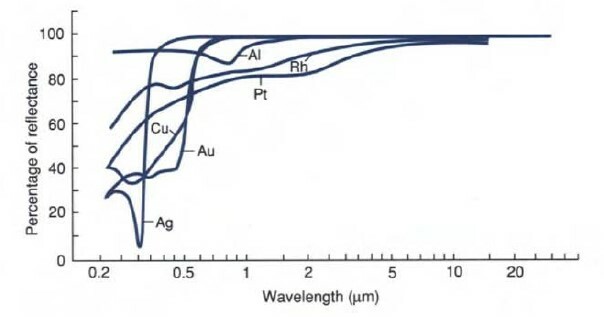 Figure: Reflectance of gold, silver, copper, aluminum, rhodium, and platinum mirror coatings as a function of wavelength. where the reflectivity of a number of metals is displayed as a function of incident wavelength. A noteworthy feature of the optical response is the decreased reflectivity in the ultraviolet and, in particular, the abrupt absorption edge exhibited in Au, Cu, and Ag. 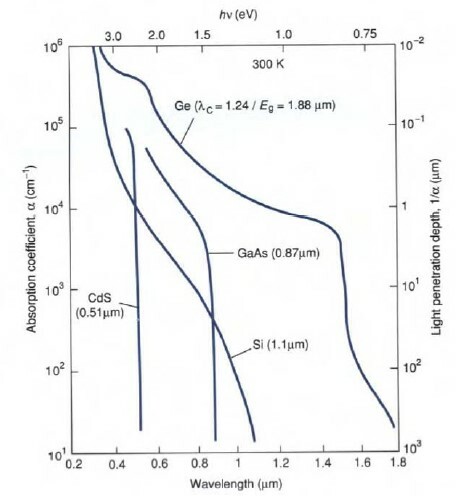 The absorption now is not of the free carrier, intraband type discussed previously, but is instead due to interband electron transitions (e.g., a 3d to 4s transition in Cu). In semiconductors it is somewhat startling to note such a strong variation in the absorption coefficient with wavelength as that indicated in Fig. 13-5. The several orders of magnitude change in a at the wavelength corresponding to the energy band gap has important implications in semiconductor optoelectronic devices. By now we are all familiar with the important interband transition that occurs in semiconductors when electron-hole pairs are created. If the incident wavelength has a higher energy associated with it than the energy band gap, electrons can successfully negotiate this interband transition. The critical wavelength, R c, required is given by equation, namely, (um) 1.24/ Eg (eV). In the case of GaAs, where Eg — 1.43 eV, k c — 0.87 gm. Photons of shorter wavelength (with higher energy than E ) are then strongly absorbed, generating free electrons that occupy excited levels in the continuum of conduc- tion band states. Semiconductors resemble metals then and are highly reflective. Photons with longer wavelengths than k c (with lower energy than E g) are not absorbed. In this (infrared) range semiconductors are transparent because mechanisms no longer exist to excite transitions across the band gap.